Protesters have called on the Prime Minister to raise allegations of persecution, torture and organ harvesting with China at next week’s G20 summit. Members of Falun Gong called for government support at a public media conference in Brisbane’s King George Square on Wednesday. 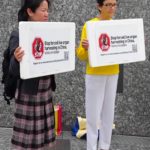 “Immediately end the brutal and senseless persecution of Falun Gong in China and also end the adherent practice of organ harvesting against prisoners of conscience in China,” group spokesman David Dowie said. He estimated 60,000–100,000 involuntary organ transplants were done each year in China, using Uyghur Muslims, House Christians, Tibetans and – the largest number – followers of Falun Gong. 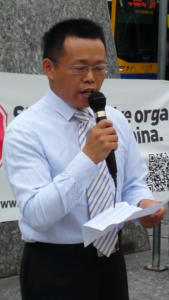 One speaker, John Meng, educated at Tsinghua University in Beijing, said he spent years in prison and labour camps where he was tortured, violently beaten, deprived of sleep, subjected to coercive brain washing and slave labour, for his beliefs. Mr Meng asked the Prime Minister “to raise the issue of human rights”, urging the Chinese government to stop persecuting Falun Gong and stop the evil practice of organ harvesting. Another speaker, Hank Chen, said: “My wife’s uncle was tortured to death, and the police guard threw his body off a building.” He said it was reported as a suicide. Mr David Yu said he spent four years in prison: “The prison guards electric shocked me for about an hour and I almost died, and I was given frequent blood tests which I later learnt for the purpose of blood matching, for organ harvesting. Queensland spokesperson for Falun Gong John Andress told Newsbytes millions of practitioners were arrested in the 1990s, followed by organ transplants. “You can get an organ in China in one week, you can get an organ in two weeks, but people don’t realise, yes you can get an organ in two weeks but somebody is going to be killed for you to have your organ,” he said. “There are estimated about 700 hospitals, mostly military, where the entire hospital is just doing transplants – 24 hours, their only purpose. Mr Andress said the Australian government was doing “nothing”. “It’s not that they don’t know what’s going on, they know very well what’s going on. The problem is the ‘trade’, it always comes down to trade,” Mr Andress said. A spokesperson for the Prime Minister’s office said an officially media release will be issued soon regarding the G20 Summit. Newsbytes was unable to contact the Chinese Consulate-General in Brisbane.